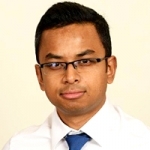 Dr. Souvik Mitra is an Assistant Professor and neonatologist at the Division of Neonatal Perinatal Medicine, Department of Pediatrics, Dalhousie University, Halifax, Canada. He completed his medical school and pediatric residency from Calcutta Medical College, India. Dr Mitra went on to complete his neonatal fellowship at McMaster University, Hamilton, Canada and is currently pursuing his Masters in Clinical Epidemiology from the same institution. Cerebral oxygenation and cardiovascular physiology in premature infants are his primary clinical research interests. He also has extensive epidemiological research experience having published a number of systematic reviews and meta-analyses. He has shared his research through webinars across Canada and the United States as well as through platform presentations at various international conferences. He has special expertise in targeted neonatal echocardiography and is a member of the Pan-American Hemodynamics (TnECHO) Collaborative.